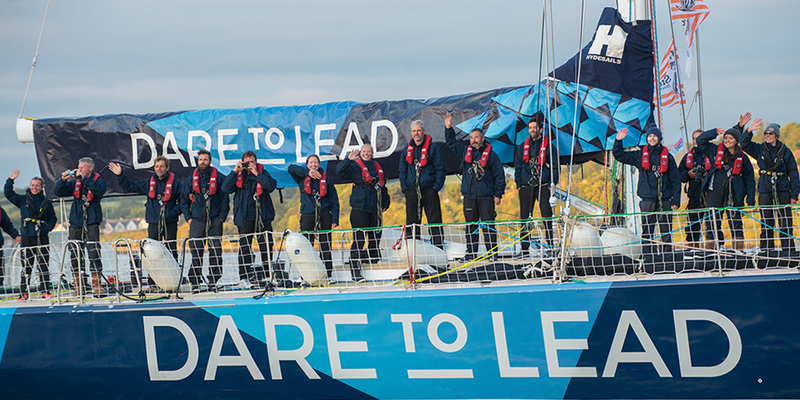 This is the fifth in a series of blogs by Dell Ambassadors competing in the Clipper Race, a 40,000 nautical mile race around the world in 70-foot racing yachts. You can find the first post from Samantha Harper, and the most recent post from Marek Omilian, on Direct2Dell. 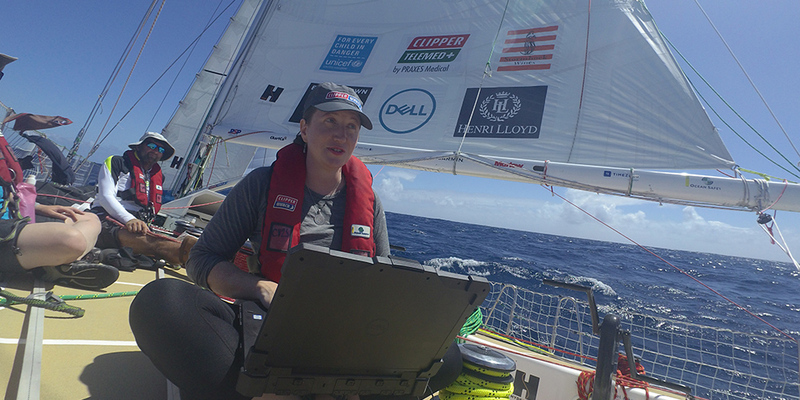 For more background on Dell’s involvement, read our initial blog about this exciting race here. The legendary Southern Ocean gave us a run for our money in Race 3: The Dell Latitude Rugged Race. The first few hours of out Cape Town harbour were met with poor winds and tricky sailing which saw us, Dare To Lead, and Sanya Serenity Coast pull away from the fleet. 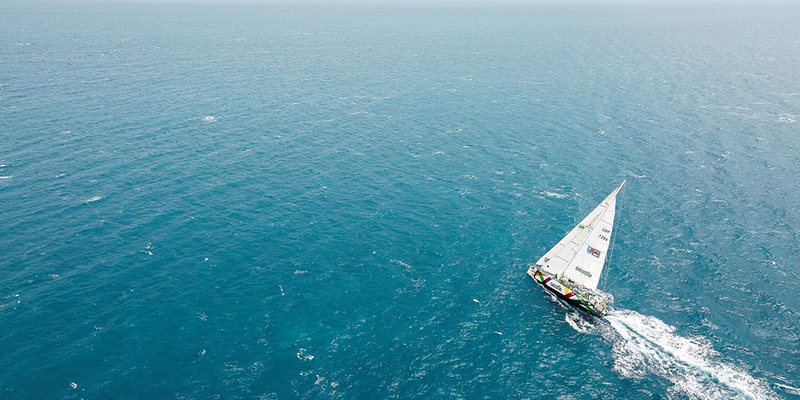 Sanya Serenity Coast continued to lead as the first night progressed and held a 100+ nautical mile lead from then until nearly the end – but more on that later! Less than 24 hours into the race, we received the sad news that CV24 (Greenings) had run aground. Many of our team had trained with Greenings crew and their skipper Andy – all great sailors and great people. As we were racing, we were spared from seeing photos and videos of that beautiful boat washed up on the beach in the immediate aftermath – a sad sight to behold. Fortunately, all crew came away from the incident unharmed and have since then been assigned to other boats, including ours. We look forward to sailing with our two new crew additions, Matthias and Jenny, during the All-Australian Leg 4. The next two weeks tested the mettle of even the hardiest and most experienced sailors on board. Instead of the downwind surfs that the Southern Ocean is known for, we sailed upwind, the boat beating along the entire time. No smooth ride for Dare To Lead! 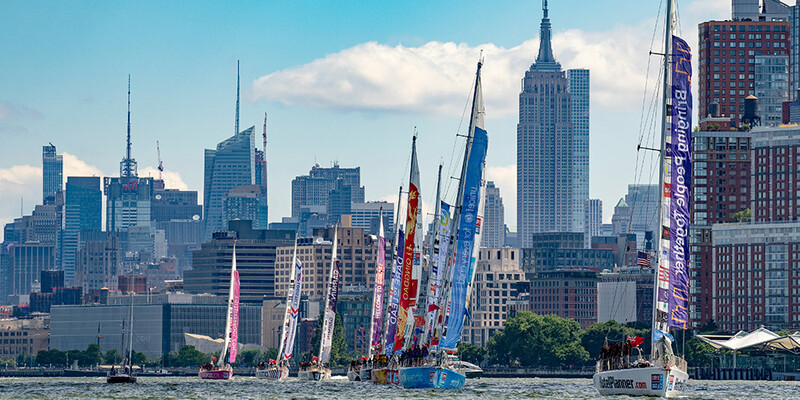 Some of the fleet went more north, others headed more south, but no one could escape the relentless wind conditions and progress was slow across the board. The ‘Rugged Race’ lived up to its name! Our boat clocked a wind speed of 74 knots during one bad squall, which might be a fleet record. 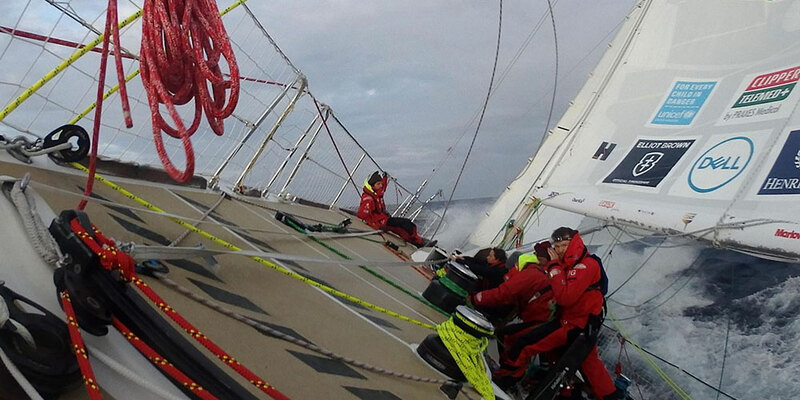 One of our spinnakers did not survive the race – blown apart by a surprise wind gust. As the medic on board, I was a bit apprehensive starting this leg, given the complete remoteness and isolation we would face being at the bottom of the world, with no possibility for evacuation in the event of disaster. I’m happy to report all CV25 crew escaped relatively unscathed. Lots of mysterious bumps and bruises, a few epic falls around the cockpit in rough seas, but nothing an icepack and some ibuprofen couldn’t handle. 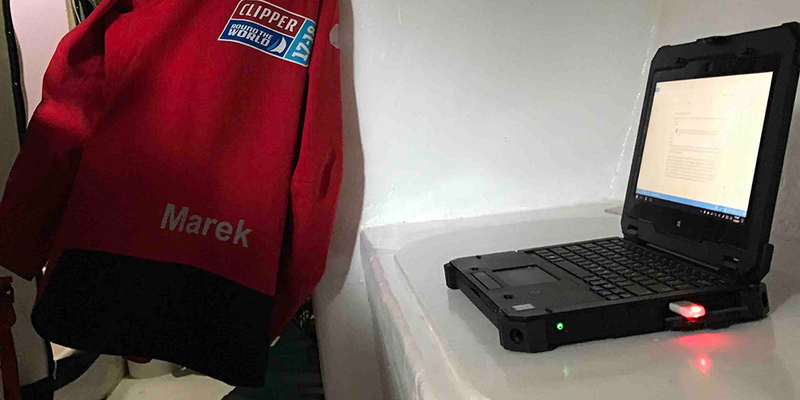 Team Garmin had a crewmember fall ill with an abdominal problem – their impressive rescue effort in conjunction with the Australian Navy can be seen on the Clipper Race website and is worth a look! 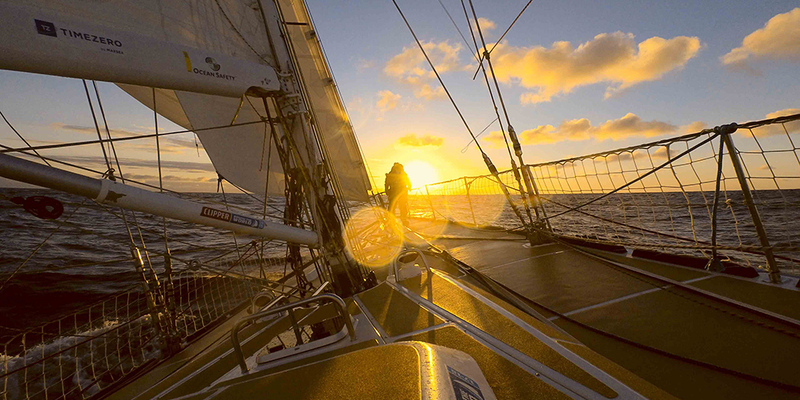 The final week of the race saw the fleet picking up speed as wind conditions became more favourable. 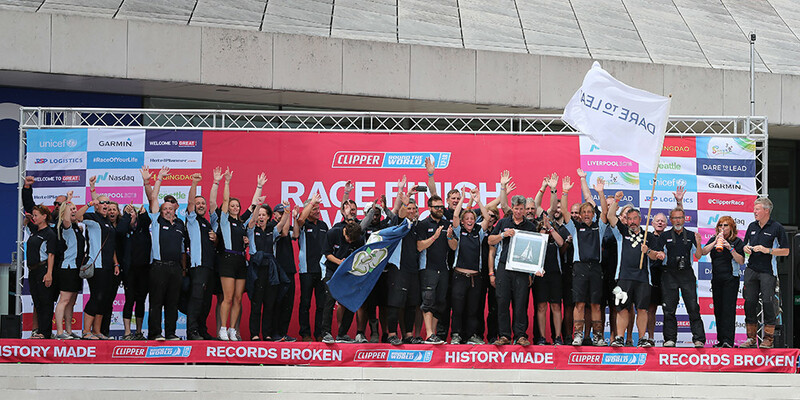 News of a fatality on team GREAT Britain shocked the fleet, and in the last few days, our team focus became more on finishing the race safe and healthy as opposed to pushing our limits racing. Despite the tragedy, GREAT Britain found themselves in a favourable pocket of wind while many of us were stalled in a ‘wind hole’ and arrived in second place. They dedicated their victory to their fallen teammate. Despite the 5000+ nautical mile distance, the boats arrived in quick order. Anticipating a sixth place finish, Dare To Lead was shocked to see Sanya Serenity Coast creeping up on our AIS (Automatic Identification System, kind of like a close proximity boat radar) during the final day. They had seen their massive lead evaporate due to bad winds and were giving 110 percent to catch up. We held them off until the final sprint to the finish when they managed to squeak past us on the final tack. 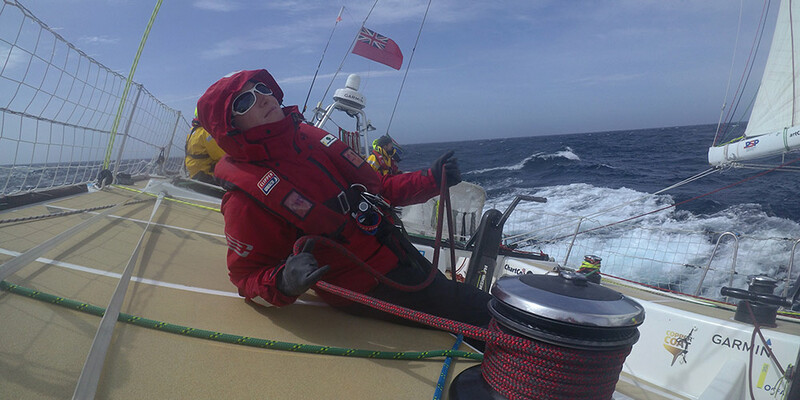 A 200m margin, or 57 seconds after 26 days at sea. As gutted as we were, it made for thrilling racing and crazed viewers at home! The upcoming All-Australian Leg 4 will feel like a pleasure cruise compared to what the Southern Ocean has thrown at us. Many thanks to Dell Rugged for their continued support of the race. The next Leg will see us take part in the legendary Rolex Sydney Hobart Yacht Race on Boxing Day, and for many of us from the Great White North, a first Christmas in the summer heat! Thanks for reading, and stay tuned for a Leg 4 wrap up in a few weeks! 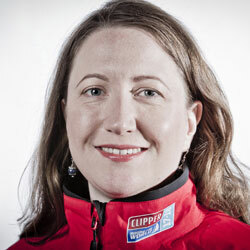 Samantha is a 37-year-old doctor from Happy Valley-Goose Bay in Newfoundland and Labrador, Canada. The Dell Latitude Rugged laptop was made for people like Samantha; when she is not sailing 40,000 nautical miles around the world on board Dare To Lead, Samantha splits her time between working in remote communities as a GP, and pushing herself to the limits mountaineering and running ultra-marathons (she has done the infamous Marathon des Sables, a 250 kilometre race in the Sahara Desert, five times). 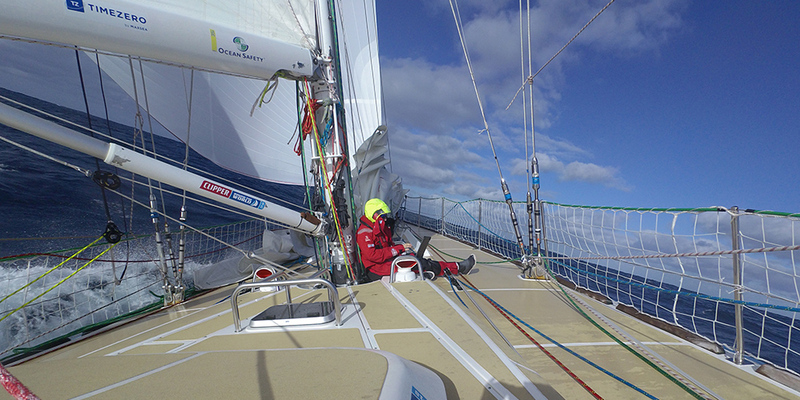 However, the Clipper Race is Samantha’s first sailing experience, and after initially considering only doing three legs, she signed up for the whole circumnavigation, knowing that once she started, she wouldn’t be able to stop until she completed and experienced the entire thing.